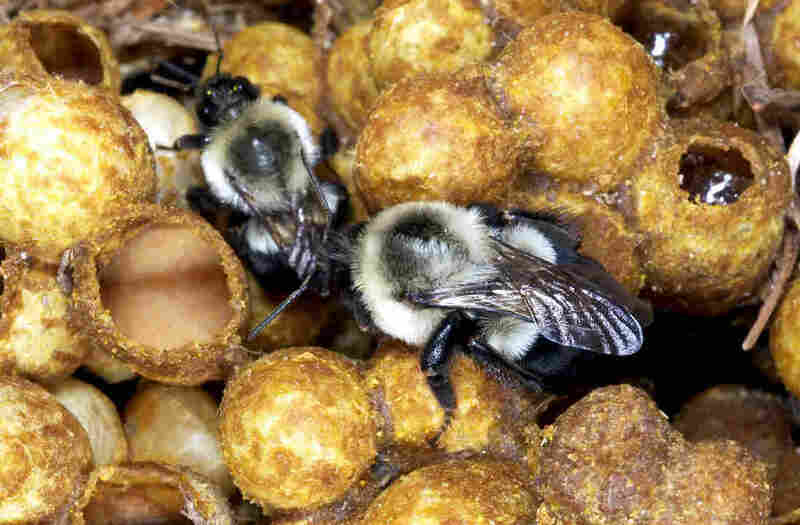 Popular Neonicotinoid Pesticides Keep Bumblebees From Laying Eggs : The Salt A new study is adding to evidence that a popular class of pesticides can harm wild bees, like bumblebees. A new study is adding to evidence that a popular class of pesticides can harm wild bees, like bumblebees. A group of scientists in the United Kingdom decided to look at how bumblebee queens are affected by some widely used and highly controversial pesticides known as neonicotinoids. What they found isn't pretty. Neonics, as they're often called, are applied as a coating on the seeds of some of the most widely grown crops in the country, including corn, soybeans and canola. These pesticides are "systemic" — they move throughout the growing plants. Traces of them end up in pollen, which bees consume. Neonicotinoid residues also have been found in the pollen of wildflowers growing near fields and in nearby streams. Bumblebee queens exposed to the pesticide were 26 percent less likely to lay eggs, compared to queens that weren't exposed to the pesticide. The team published their findings in the journal Nature Ecology and Evolution. "Without the queen laying eggs, there is no colony," says Nigel Raine, one of the scientists who conducted the experiment. Raine helped start the experiment, but has since moved to the University of Guelph in Canada. According to Raine and his colleagues, the reduction in reproduction is so large that wild bumblebee populations exposed to these chemicals could enter a spiral of decline and eventually die out. "To me, based on the data we have, it seems like quite a big impact," Raine says. But he says scientists don't know how harmful the pesticide exposure is in the wild, compared to other perils the bees face, such as disappearing wildflowers that bees rely on for food. "I don't think we have a really good handle on how important, say, nutrition limitation is — if they can't find the right flowers. Or parasite loads. I'd say [neonic exposure] is important and significant, but other factors may be important and significant, too," he says. The results are likely to strengthen calls for further restrictions on use of the pesticides. The European Union imposed a temporary moratorium on use of neonicotinoid pesticides on many crops in 2013, and is now considering proposals to make that moratorium permanent. Pesticide companies and some farmers are fighting those restrictions. They argue that the moratorium has led to lower yields of canola and an increase in spraying of other pesticides to fight insects that previously were controlled by neonicotinoid coatings on seeds.